Burning Man debut just days away! I’ve gone dark since my first animation demo because I’ve been pouring nearly every waking hour into either the software components of the suit or preparing animations for the suit using my Animaker software. I shipped the physical Anthrolume 2.0 suit to Berkeley a couple of weeks ago, before I headed off to Bora Bora for a vacation. During the time I was on that beautiful island (when I wasn’t snorkeling, swimming, sunning, etc.) I created about 115 animations. I also made signficant improvements to my Animaker software. On the top left is a Flash animation I created using a relatively inexpensive but quite powerful Flash animation package called SWiSH (no affiliation). 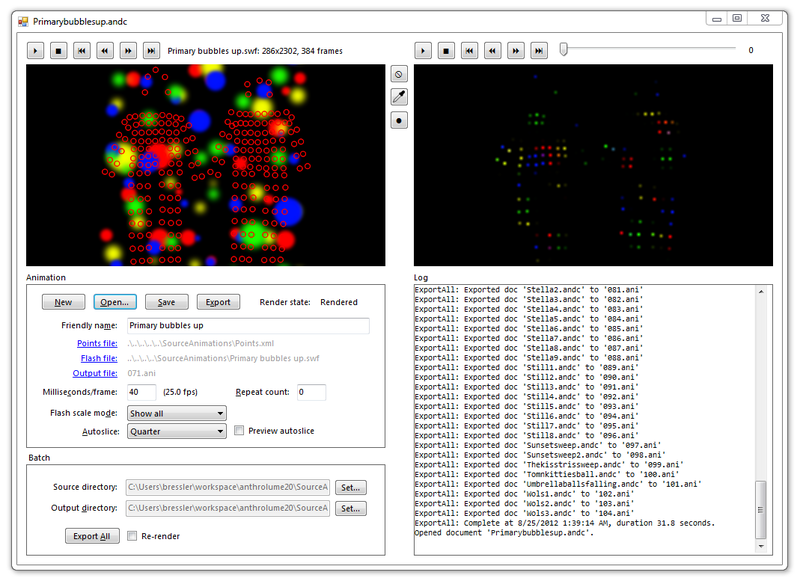 The red circles represent the points at which the software will sample the video to create the animation. On the right is one frame of the animation that was sampled from the Flash movie. I put the output files from Animaker onto a micro-SD card that plugs into the Arduino Mega microcontroller on the Anthrolume suit’s belt. That computer plays back the animation frames into the LEDs of the suit. I will continue to make new animations even while I’m on the playa at Burning Man. I’ve got a Flip video camera with me so I’ll have quality video this time, not just of me, but of my entire whack Prismaticamp crew, when I return from the Burn. Categories: anthrolume 2.0 | Permalink.